Yesterday I reported that two "moderate" groups of US House of Representatives members are meeting to seek areas of bipartisan agreement. Rollcall.com said this: "The Tuesday Group and New Democrats met on Tuesday, bringing together moderate members of both parties to talk about areas that may be ripe for bipartisanship." 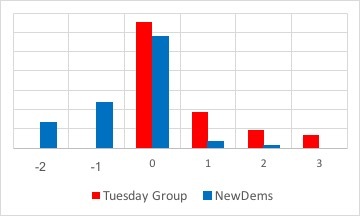 The Tuesday Group is Republican and the New Democrats are, well, Democrats. Given the polarization in Congress, what common ground can they find? I did a little research to find out more about the ideological makeup of the two groups and their voting records. My data on voting records come from the FiveThirtyEight Projects' Tracking Congress In The Age Of Trump. An updating tally of how often every member of the House and the Senate votes with or against the president. I discovered 43 members of the Tuesday Group and 59 members of the New Democrats. For each one I retrieved from the 538 database the percentage of their votes that agreed with President Trump's positions. I also retrieved the difference between the percentage of their votes and what would be expected from the way their districts voted (for or against) Trump in the 2016 election (538's "Trump plus-minus scores"). The latter measure is of interest because it reflects the extent to which a Representative is more ideologically extreme than his/her constituents. Over half of the Tuesday Group's votes agreed 100% with Trump positions. The lowest score was 78.9%. The score in the New Democrats was 71.1%, and the rest of the Democrat's scores were below 50%. The Trump plus-minus scores are summarized in the accompanying graph. Scores were categorized into bins and are represented along the horizontal axis with numbers of Representatives falling into those bins on the vertical axis. Most of the plus-minus scores clustered around zero for both groups. That means that the Representatives are voting consistently with what would be predicted from how their constituents voted in 2016. Both groups had members that voted more extremely. The Tuesday Group (in red) showed a tendency for some members to vote more frequently with Trump. The opposite was true for the New Democrats; some of their members voted more extremely in opposition to Trump than did their constituents. If you believe, as I do, that our political polarization stems from deep-seated beliefs that are difficult (if not impossible) change, then these data to not portend well for bipartisan agreement on very much - if anything at all. The problem is that the things that should attract bipartisan support - health care and infrastructure for example - also trigger reactions based on those deep-seated beliefs. And those beliefs are reflected in the voting patterns of our Representatives. For example, is health care a right or a commodity? Am I overly pessimistic? Perhaps. I'll continue to track these groups and look for joint communications about points of agreement and joint action.